S.O. 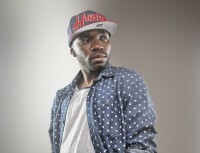 : Another member of the London gospel hip-hop underground breaks through - S.O. Another member of the London gospel hip-hop underground, S.O. has been getting radio play recently with "Love Is" a fixture on the Cross Rhythms playlist and now the emcee's new album 'So It Continues' is receiving similar exposure. What is particularly intriguing is that the Nigerian-born, London-based rapper has secured a deal with American hip-hop label Lamp Mode Recordings. Cross Rhythms began its interview with S.O. by asking him about the London gospel rap scene. "I feel a part of the scene. I love London and love the people here. It's my desire that we continue to build upon what is happening in the underground, that those 'above' us will hear the loud noise we are making in the basement and will HAVE to come and check it out! It's growing and the movement (by God's grace) is getting bigger and bigger." S.O. was born Seun Otukpe on 5th December 1988. He explained, "I was raised by my mother and father in Africa until it was decided that we would be moving to London. I believe I was around eight or nine when this happened. I come from a church-going home that actively sought to serve as part of the Body. Though I was 'raised' in the church I was not a Christian. My life looked different to many my age (no drinking, no drugs, no parties, etc) but my heart was not submitted to the authority of Christ - he had not worked in me. I was 15 when my conversion happened. A friend of mine had passed away in her sleep and this shook my foundation. Until this point my thinking process was simple: I thought that I could play church at a young age and serve God when I was older, like 30-40 or something. I also thought that nobody died when they were young (silly I know), so I thought that I had time and that time was in my hands. To make a short story even shorter, I was rocked by the Gospel and the reality of his death for my sins! The Gospel was clear to me - I had sinned against God and I was to be punished BUT I could be forgiven if I placed my trust in the Saviour Jesus Christ. And so I did and the journey began." Music was always an important part of S.O. 's life. His father was a particular music fan. Said the rapper, "I regularly heard MJ, Boys II Men, Fela and many others in my house. Hip-hop was not far away either. My father really installed in me a love for music and taught me (indirectly) to listen to everything - so that is what I did. My hip-hop collection was so diverse - I had Nas, Jay-Z, Eminem but I also had Lil Bow Wow, LL Cool J and Will Smith in there somewhere. I listened to everything that came out when I could but my main influences were definitely Nas, Jay-Z and Eminem." In 2011 S.O. began working on his 'So It Begins' album from which sprang the "Love Is" track. He remembered, "I recorded the bulk of the album in a week. My good friend Craig and I locked ourselves in a studio and laced the tracks. I work like this and enjoy this process the most. It means I gain momentum and push on until it's done. 'Love Is' was inspired by my testimony. I used to try to find love in many things except for where true love was found - namely in the person and work of Jesus. 'Christ shows his love for us in that whilst we were yet sinners he died for us' - these are the words of Paul to the Roman church and his whole thought process is simple: love is visibly seen in God the Son dying for his enemies!" S.O. spoke about his second release 'So It Continues' which, like its predecessor, was produced by GP and contains features from Leah Smith, Sean C Johnson, Lecrae, J Williams, Shai Linne, Andy Mineo and E-Tizz. I initially just wanted to create an album to showcase my love for Jesus and my artistic level. But it was the fans who demanded (through tweets and facebook messages) that I call my next album 'So It Continues'. With this album I'm continuing the stories and thoughts that were in 'So It Begins'. I am being more open, honest and vulnerable. With songs like 'Lamentations' (a song about the death of my father) and 'Passion And Purity' (a song about my battle with lust and my desire to glorify God in all I do). I'm just an honest person and I think that comes out in my music. Through my music I put my life on display and writing this way frees me up to be myself. Another song that displays this is a song called 'Elisabeth's Interlude'. In this song I rap to an old white caucasian woman whom I love because she loves Jesus. Elisabeth Elliot (who the song is named after) has influenced my thinking in ways only I know so I took my love for her and put it in a song." ... I examine myself like I suppose to then I pray to Lord like keep me, yeah Lord keep me... U are being used by the Spirit. Nice 1.